The halls and outdoor exhibition areas at Eurosatory 2018 were filled with enough armoured vehicles to launch a land invasion. With a renewed focus on main battle tanks, some were bigger and better armed, while some special ops vehicles were smaller and more agile, but all were packed full of innovations designed to persuade international decision makers to loosen their defence departments’ purse strings. Berenice Baker reports from the event. BAE Systems showcased the latest model of its MkIV CV90 Infantry Fighting Vehicle, decked out in a paint job more reminiscent of a Hawaiian shirt than camouflage. Image: BAE Systems. BAE Systems showcased the latest model of its MkIV CV90 Infantry Fighting Vehicle, decked out in a paint job more reminiscent of a Hawaiian shirt than camouflage. It came equipped with iFighting, the company’s new battlefield situational awareness technology which fuses data from various sources and prioritises the information it displays for the crew to act upon. 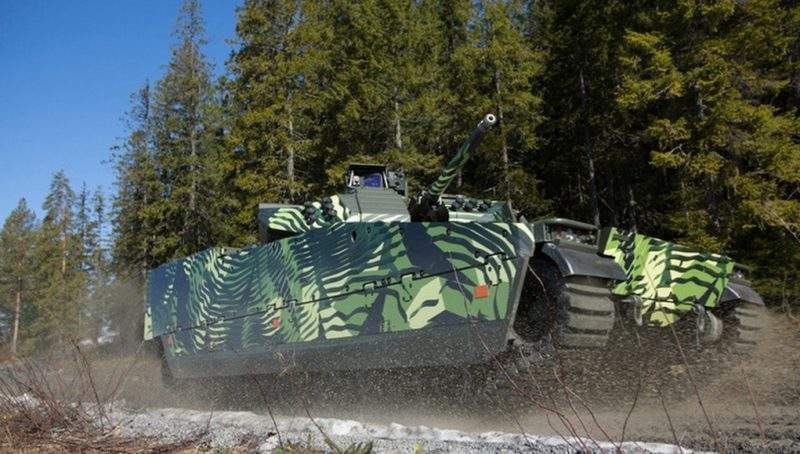 BAE Systems says this fifth-generation CV90 has improved speed, mobility and electronics, and it has partnered with Czech companies to offer the MkIV to the Czech Army. It makes a bold statement to name a vehicle European Main Battle Tank (EMBT), but the European Defence Agency initiative aims to address the ‘evolving strategic situation’ in Europe which has led to an MBT capability regaining importance. The EMBT technology demonstrator unveiled at Eurosatory brought together established MBT technology from French and German manufacturers in the form of the KNDS Group (Krauss-Maffei Wegmann and Nexter Defense Systems). This approach meant that the prototype was built less than three years after KNDS was formed. The hull, engine and chassis derive from KMW’s Leopard 2A7 and can carry up to 68 tons. The chassis was modified to accommodate a lightweight gun turret with automatic loading from Nexter’s Leclerc MBT, which can be operated by two crew members instead of the usual three. It was a bit of a surprise to see a historical re-enactor in full regalia standing next to one of the displays, but the General Dynamics Land Systems (GDELS) Pandur family of armoured vehicles is named after military units dating back to the 18th century. They come in 6×6 or 8×8 variants, including an amphibious configuration. The 8×8 can be configured as an infantry fighting vehicle with up to 30mm two-man turrets or an armoured personnel carrier that holds up to 13 people, and can also be operated in recovery, reconnaissance, ambulance or communication roles, or as a command post. For improved survivability, all the major automotive components — powerpack, drivetrain, fuel tank and hydraulics — are mounted inside the armoured steel hull. GDELS says it currently maintains more than 3,000 Pandur platforms worldwide, 1,000 of which are operated by NATO member countries. Eurosatory saw the European debut of the Yagu, a tiny 1.48-ton fully protected assault vehicle built with special ops in mind. Based on the Arctic Cat Wildcat 4, it is built for a crew of four and protected by a carbon fibre-Kevlar composite capsule that offers B6+ level of protection. Its 95bhp engine delivers a power-to-weight ratio of more than 60bhp per tonne, keeping it agile for the off-road and urban operations for which it is intended. Firepower comes via a 5.56mm or 7.63mm machine gun operated safely from inside via electro-optical sensors. The vehicle can also be equipped with an integrated hardened drone that can be operated tethered or free-flying to deliver mission information from beyond the crew’s line of sight. Plasan also used Eurosatory for the world launch of its fourth generation Sandcat multirole vehicle, including the new mine-resistant light patrol vehicle variant, and it displayed the Hyrax light armoured all-terrain vehicle. AM General unveiled its next-generation High Mobility Multipurpose Wheeled Vehicle (HMMWV, better known as Humvee) at Eurosatory. The NXT 360 is a light tactical vehicle available as a complete vehicle or as an upgrade kit for existing customers. It can be fitted with a Hawkeye 105mm weapon system, which AM calls Enhanced Tactical Indirect and which delivers eight rounds a minute for three minutes, with sustained fire of three rounds a minute, and features hybrid soft recoil technology enabling it to be used on a lighter vehicle. Advancements in this model include improved ballistic and blast protection, a higher payload capacity of up to 7,100kg and improved power from a P400 V8 engine that delivers 250hp. While no longer the new kid on the block, the Oshkosh Light Combat Tactical All-Terrain Vehicle (L-ATV) was at Eurosatory to deliver a programme update. The L-ATV comes in two main varieties and four different configurations. While customisable for different applications, it uses the same drivetrain and suspension, wheels and dash throughout. It won the US Army’s JLTV programme in 2015, followed by a low-rate production order of 657 trucks. “Once in the hands of soldiers they can tailor it still more depending on the operation and mission,” he continued. “It comes armoured, but they can add more, like ballistic and IED side protection, and it can support turret-operated systems, remote weapons systems and tube-launched missile system. Oshkosh went on to announce on 13 July that the US Army had ordered 1,574 more JLTVs. Eurosatory 2018 introduced more new armoured vehicle technology than it would be possible to comprehensibly catalogue in one place. Some technology demonstrators pushed the boundaries of possibility and may never see the light of day in their current format, whereas many established platforms showcased enhancements that will be a guaranteed upsell to a loyal customer base. Which innovations will translate into orders remains to be seen, and the shifting landscape of land systems will no doubt turn up a whole new batch of pioneering vehicles at future military technology events.